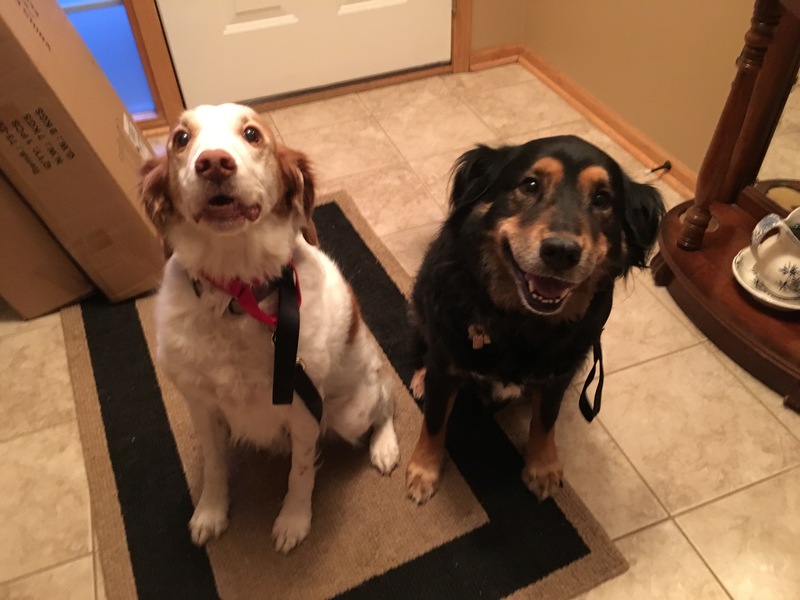 Maggie (right) is a nine-year-old Collie Lab mix who lives in Papillion with Lucy, an eleven-year-old Brittany. The dog’s guardians set up a dpg behavior training session with me to address Maggie’s fear of new people, leash aggression towards other dogs and Lucy’s habit of pulling on the leash. Normally when I work with a anxious or nervous dog who is fearful of humans, they keep their distance during the greeting. Knowing that Maggie was wary of new people, I had worn the same pants to a few dog behavior sessions to “load up” on scent. A dog’s nose control 60% of their brain and because they can only focus on one thing at a time, the scent from the previous dogs I worked with distracted Maggie from her fear. However as you can see in the above video, as soon as Maggie got done sniffing me, she moved a little farther away and stiffened up. She also disagreed when she saw me look at her. For many dogs, eye contact can be interpreted as a challenge. Other dogs are simply reactive to direct eye contact and clearly it was impacting Maggie so I made an effort to avoid looking at her directly in her eyes. I sat down with the guardians and spent a few minutes going over the dog’s day to day routine and the structure that was in place. When people have an insecure dog, they often think that eliminating rules, boundaries and limits is a good way to help them. But in reality, this can cause the dog to think they are in a leadership position and just like humans who are responsible for others, that can increase stress. I suggested the guardians incorporate a number of rules and boundaries to help Maggie start to see them as authority figures and herself as one of their followers. This transformation will go a long way towards helping reduce the stress in Maggie’s life. During our discussion, I made no attempts to pet, look at or talk to Maggie. I did offer high value treats to start to generate some positive association; first tossing them on a nearby dog bed, then on the floor closer to my feet and eventually out of my hand. This sort of positive dog training is the only way to go with an anxious or insecure dog. Even when she was taking the treats from my hand, I could see she was still an anxious dog and uncomfortable so I continued to avoid petting her. I knew I needed to continue to build up the dog’s trust in order to work with her directly. I recombined the guardians start to practice my Petting with a purpose method. This involves asking the dog to sit or lay down to “pay” for attention from the humans. This is another way to help Maggie start to feel more like a follower which should also help reduce stress and anxiety. Once Maggie was calmer and more relaxed, I showed her guardian a Focus exercise that will help her learn to focus, lol, and also give the guardian an effective way to distract and redirect the dog’s attention. After demonstrating this for the guardian, we switched places so I could coach her through the same exercise. It took the guardian a little practice but eventually she got it. She will need to make sure to not delay either movement; the treat should be raised up in a one second movement, then travel towards the dog’s mouth in another one second movement. The guardian will also need to say the command word “focus” the instant the treat is popped into her mouth. While we were practicing, the guardian was saying the command word when she raised the treat, but the connection is made when its delivered into the dog’s mouth. Once the humans had practiced enough to develop good technique, I went over the instructions that they will need to follow to expand upon the Focus exercise. If you have a leash reactive dog, I strongly recommend you pick up my mentor Karen London’s book Feisty Fido. Not only is it a quick and easy read, every leash reactive dog I have use the technique on has learned to be calm or even friendly around other dogs on the leash. Dont say “good girl” when Maggie is nervous to avoid making that expression a command word for getting nervous. Pet Maggie with a Purpose. Use passive training to pet Maggie while simultaneously saying the command word within 3 seconds any time she does a desired action on her own. Avoid petting her on top of Maggie’s head. Pet Maggie under the chin as much as possible. Only pet Maggie when she is in a calm, balanced state of mind. Consistently disagree with breaking of the rules or boundaries within 3 seconds using the escalating consequences. Whenever possible disagree before crossing a rule or boundary. If possible, recreate situations or scenarios to help Maggie practice the desired behavior. Practice the door answering exercise. Practice the Focus exercise multiple times a day in different location in short 1-2 minute practice rounds. Once Maggie is consistently focusing on command, start increasing the delivery delay on the second movement. Only add one second at a time to the second movement so its a gradual progression until she can focus for 20+ seconds. Once a 20 second focus can be achieved consistently inside, guardian needs to start practicing it when on walks WITHOUT other dogs around. If the guardian encounters another dog on a walk, she should execute a U-Turn and move to a place where Maggie cannot see the other dog. Keep increasing distance between Maggie and any dog she is reacting to until she can relax (indicated by easily sitting down). Walk the dogs separately to help them learn how to walk in a heel and prevent them from pulling their handler down. No more people food, especially from the table. Have guests drop 3 high value treats every other step once they pass the door boundary. Guests should ignore Maggie. If Maggie approaches a guest, have them extend their arm to their side with a treat in their hand (palm up) or drop it on the floor to the side.